After several years of raising Cornish Cross chickens as our meat birds, we decided it was time to compare them to another meat bird we’d been hearing a lot about: Red Rangers. So we did an experiment. I bet you’re here because you want to know who won the mighty battle between Cornish Cross vs. Red Rangers at our farm. Note: this is simply one farmgirl’s experience regarding two breeds of meat birds. Your experience may be different. c) incubate and hopefully hatch out more Red Rangers! It would be a closed system! 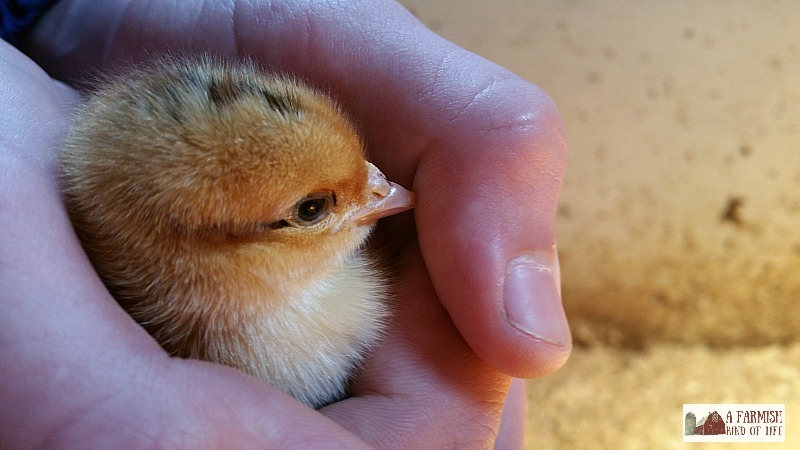 We would no longer have to buy Cornish Cross chicks every year! Our plan could not fail! In my excitement, however, I failed to see something that seems rather obvious now: if it was such a perfect plan, why wasn’t everyone doing it? Our dream to keep some Red Rangers, collect their eggs, incubate them, and hatch them out so we could have a closed system for meat birds quickly crashed and burned when someone hinted to us a wee bit into our experiment that Red Rangers don’t “breed true”. Meaning that even if a mommy and a daddy Red Ranger love each other very much, their babies aren’t necessarily going to have the traits of Red Rangers that we would be looking for. Well, then. Must have missed that little nugget in my original research. Cornish Cross vs Red Rangers: the plan…and how it failed. Now knowing that the Reds didn’t breed true, and being fully aware that the Reds grew slower than the Cornish Cross, our plan was to keep all the meat chickens for 9 weeks and butcher them all at the same time. We knew the Cornish would be on the larger end of things and the Reds would be a little smaller than they could have been, but we didn’t want to set up another butcher day—we already had 3 big butcher events planned at our farm for the year! By butchering both the Cornish and the Reds at 9 weeks, we knew we we’d be looking at something “a little” smaller with the Reds. Over the weekend that our meat birds reached 8 weeks old, we had our first Cornish Cross die—as well as another Red Ranger (the 4th since we’d started the experiment). As is our usual practice when a chicken dies from an unknown cause, we decided to breast the chickens out for our dog. 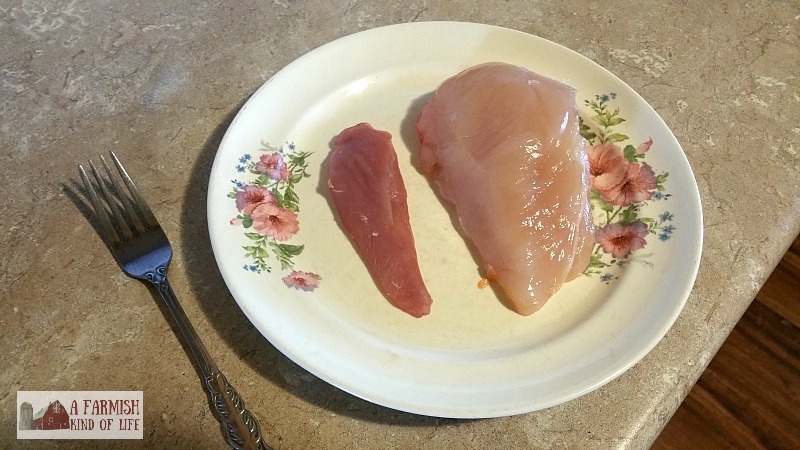 Below is the comparison of breast meat from two 8 week old birds – Red Ranger on the left, Cornish X on the right. When Cornish Cross butcher day arrived, however, we did butcher the largest Red Ranger rooster. I wanted another comparison—this time a full bird. I mean, the chicken breast comparison a week earlier had to be a fluke, right? So, let’s discuss how much these chickens eat while we punt through this experiment some more, yes? Cornish Cross vs. Red Rangers: how much do they eat? We feed twice a day; once in the morning and once at night. Since our experiment wasn’t intended to figure out who ate what food, I don’t have an exact division of numbers. But I’ve got a pretty solid idea, and you can take my observations for what it’s worth. What I can tell you is that the Rangers did not eat noticeably less than the Cornish. They were all—both Cornish Cross and Red Rangers—at the feeders, ready to knock down the feed lady (me) when she came in. They all—both Cornish Cross and Red Rangers—stuffed their faces into the feeder and gobbled until all the feed was gone. No, the Red Rangers were right in there with the Cornish Cross, eating until the food. was. gone. Since we decided to delay the butchering of the Red Rangers due to their small size, I wondered: when the Cornish Cross birds are gone, how much food will we be going through? It is common to hear that Red Rangers eat less than Cornish Cross. Since the Cornish Cross had made up more than half of our flock, would our feed usage after the Cornish Cross were butchered drop by the same percent as the amount of birds that had been butchered? Or would it drop by a more drastic amount? If it didn’t drop by a noticeable amount, that would seem to mean the Red Rangers (and 9 turkeys) had been eating just as much as the Cornish Cross had. Which would mean that Red Rangers eat the same—or close to the same—amount as Cornish Cross for a longer amount of time, which results in a finished bird that is comparatively…what size? 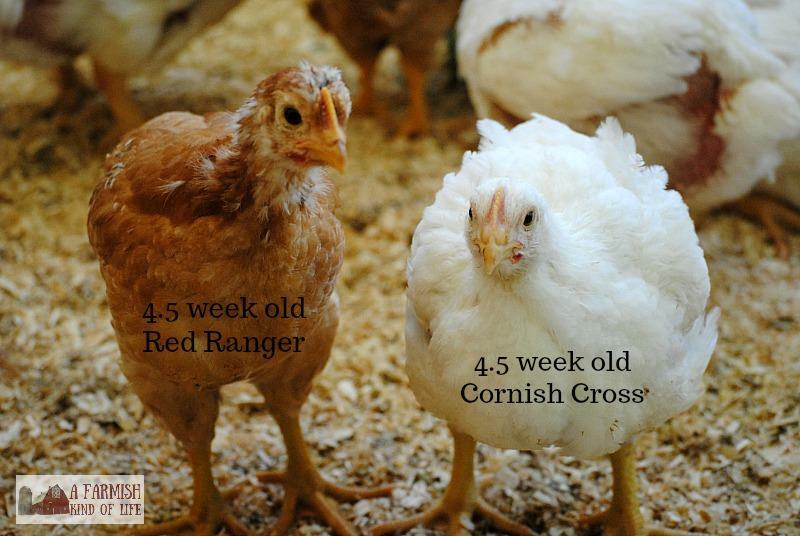 Cornish Cross vs Red Rangers: free-ranging? I’ve been asked a few times about whether or not we free range our meat birds. In the past, we had a couple batches of Cornish Cross birds we that free ranged. We are currently not free ranging any of our animals because of an increase of predators in the area—mostly wandering dogs. So I have no experience to share with you regarding how well these Red Rangers did at foraging and free ranging. What I can tell you is that when our Cornish Cross were free ranging, they took much longer to grow out—which coincidentally is what I’ve also heard from several folks regarding Red Rangers. It makes sense. When you’re free ranging, you’re finding your own food—but you’re also using way more energy (burning more calories) finding that food. So, yes—meat birds can be great at free ranging. Also, yes—if they’re free ranging, they might grow more slowly. Cornish Cross vs. Red Rangers: what about leg issues? 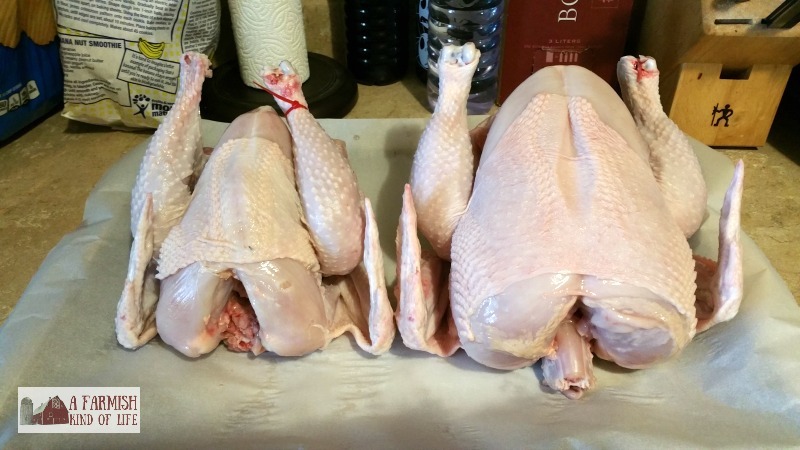 I am no stranger to leg issues in chickens. We’ve raised Cornish Cross since 2012 so I know what happens when Cornish Cross birds get too much food and grow too fast. One of the great things about Red Rangers is they supposedly they don’t get the same kind of leg issues. Apparently, someone didn’t inform my particular batch of Red Rangers. I had 4 Red Rangers (of 35) go down with leg issues in the first 8 weeks. How many Cornish Cross? None. None, I tell you. Note: We have determined that really good feed management is super important in the Cornish Cross. Our first year with them, we basically fed them when they looked hungry. We’ve learned a lot in the last several years. This year we really watched how much food they got, and had a much better experience both with their mortality rate and their activity level. They were still trying to fly to see the feed lady (me) right up until butcher day. I realize this is just one Cornish Cross vs. Red Rangers experiment, and that other people may have different experiences. I’m simply here to tell you what we experienced in our 9 weeks with one particular batch of Cornish Cross and our 20 weeks with one particular batch of Red Rangers when their butchering day arrived. Please don’t send me hate mail. I’m just calling it as I saw it in my barn. Cost to raise per bird: $3.80 for a 4 lb (avg) bird or about 95 cents per pound. Remember, our original purpose for doing the Cornish Cross vs. Red Rangers experiment had nothing to do with how much it cost to feed Red Rangers—all we were concerned about was getting to the point of incubating. When we realized there would be no incubating, we (unfortunately) stopped tracking the bird specific feed usage. So you are welcome take these numbers with a grain of salt — but not too much. I know how many bags of feed were empty in our barn. We are counting 22 pounds of feed per bird to finish off a Red Ranger for 20 weeks. Cost to raise per bird: $8.70 for 4.5 (avg) bird or about $1.95 per pound. Obvious question: Would the cost to raise have been less if we wouldn’t have waited until 20 weeks—turkey butcher day—to butcher the Red Rangers? Perhaps. We could have butchered at 12 or 16 weeks. But would we have still ended up with Red Rangers having an average weight of 4.5 pounds? Or would they have been smaller? Cornish Cross vs. Red Rangers: final thoughts? So, I mean, here’s the thing. Y’all. Basically, I raised birds for five months that averaged 4.5 pounds each. My Cornish Cross were a 1/2 pound short of that in 9 weeks of decent food rations. From the numbers above, you can see that in our particular experiment, it cost twice the amount to raise the Red Rangers for a bird that was only a half pound bigger in size. It was nice to have the Cornish Cross vs. Red Rangers experience, but we’ve decided we won’t be raising Red Rangers as our meat bird again. We’re choosing to stick with Cornish Cross—especially after having an exceptionally great experience with them this time. I’m telling you — proper care and feeding is key to not raising a Cornish Cross that looks all Franken Chickenish and can’t walk after it’s a month old. It is possible to raise a happy Cornish Cross who can actually fly right up until butcher day. I know it is. Cornish Cross. vs. Red Rangers: more thoughts! I have more thoughts specific to the Red Ranger—how do they taste? Were they hard to butcher? What’s with their skin? Tell me all the things!— at Red Rangers: 7 Reasons We Won’t Raise Them Again. Check it out. And if you’ve got more questions, let me know in the comments! I love your blog. I was happy to see your comparison of the two meat bird breeds. We have done some similar research at our place. Yes, we found that the Cornish cross are cheaper & faster to raise. But, after several blind taste tests, the Freedom Rangers always win. The yellow fat marbling has such a good taste. We raise our rangers to 12 weeks and they weigh out at about 4-4.5 lbs. After 5 weeks, we keep them in a chicken tractor. We find it gives them just enough space to dig for bugs and such. But not enough to make them run too much & make the meat tough. Great article; lots of detail and viable information. However, I was very surprised at the (low) weight of the processed (Cornish) birds. I began raising CC about six years ago and, like many other endeavors, time and experience produced better results. 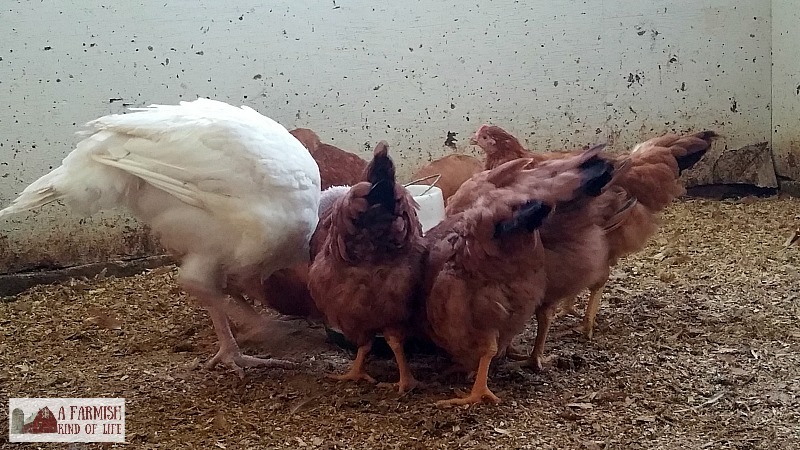 I usually order all cockerels, because they finish out at a much higher weight than the hens (WELP Hatchery has prices, and they drop considerably as you increase the quantity) and my last order (100 cockerels ) was just under $200.00 including shipping. As do many hatcheries, WELP included a few extra chicks, at no charge, to account for the inevitable losses during shipping. For the first three weeks, they are fed 24/7 and I use 28% protein meat bird feed. I use white/clear heat lamps during this time, which allows the chicks to see the food when it is dark. After three weeks, I use a 20 – 22% protein feed and only feed them for twelve hours a day. I usually put the food in around 6/7 am, and take it out around 6/7pm. 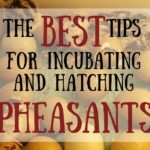 By three weeks , they are usually feathered out and don’t need additional heat, but – if they do – I replace the white/clear lamps with red ones, because it allows the chicks to have darkness as the natural light dims. HOWEVER, I do keep a regular white light on a timer, to ensure the birds have 14-16 hours of ‘light’, to stimulate their eating. Once they are fully feathered/weather is consistently warm, I remove the heat lamps but LEAVE the white light on a timer. They will stay on this schedule until processing time. Occasionally – I will butcher the birds ‘around ‘4 weeks if I want some Cornish hens or, if I want a few smaller broiler birds, I’ll process some at 5-7 weeks. I will also butcher birds with broken legs, or let the dogs have them (after an expedited demise). But, aside from those exceptions, , I usually feed them out to ten weeks. This is where we really have different results. MOST of my birds will dress out around 8-9#. Even though I order all cockerels, there are always a few pullets/hens, and they just don;’ grow as fast/large, so they usually dress out (at 10 weeks) around 6#. On the other ends of the spectrum (small to really large) there will be birds dressing out between 5# and 10#. My biggest bird dressed out at 11.25#. It literally looked like a small turkey and the breast meat looked like chuck roasts. Obviously, that was an exceptional bird, but with the average birds dressing out between 8-9#, you can see why I found the weights of your birds to be considerably different. When I first started raising them, the average weights were around 7 -8#, but – after reading numerous articles about protein levels, feeding AND lighting schedules, as well as the use of white/clear and red heat lamps, I was able to ‘fine-tune’ the process and have had consistent results for the last 3 years. I appreciate the effort you put into the ‘research’ and reporting, and hope some of my information is helpful, as well. Just curious if you lose many birds to heart attacks or leg problems? This is only my second year doing Cornish X, and I’m a bit disappointed with the results we have as we are starting to butcher. So far we have had an average of 6# birds, but they are 13 weeks old already! Definitely need to reevaluate things if we are going to be raising birds again next year! Thank you for your blog! Just discovered it tonight, and have found several very insightful articles. We will be butcher our own pig for the first time this weekend, your article about cutting up the carcass was very helpful. Did you buy them from Freedom Ranger Hatchery? On their website they tell you the Red Ranger is the so growing bird and the Freedom Ranger is the fast grower. 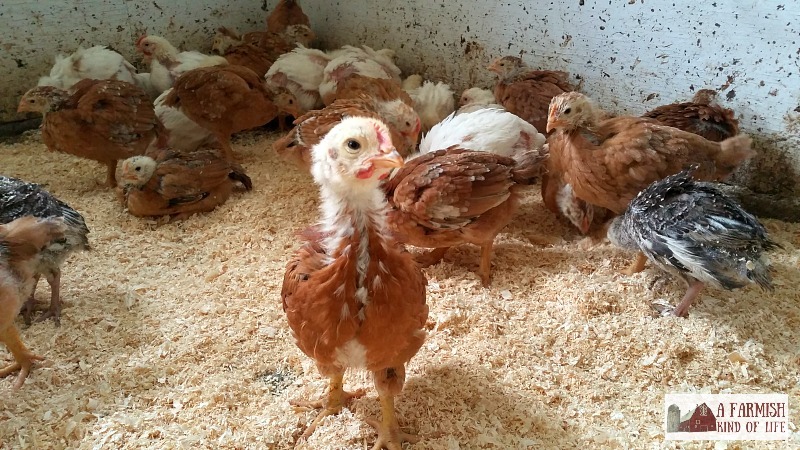 “Perfect for free range environments, these tri-colored or red feathered chickens grow to 5-6 lbs in just 9-11 weeks. 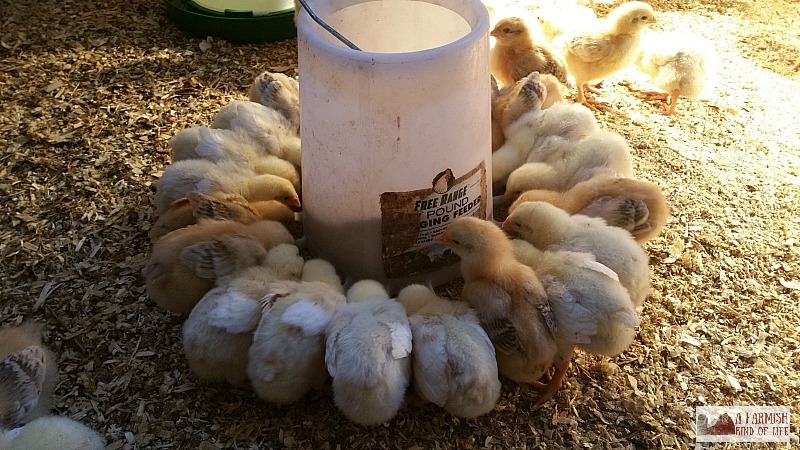 Baby chicks for sale each week.” The Freedom Ranger Color Yield is an even faster growing bird. Be interesting if you tried these other 2 varieties to see how they compare to the Cornish Cross. I would like to know where you are buying the Cornish Cross for $1.20. That is an incredible price. I’ve only seen prices around $2 a chick. To me that is almost a none starter. How can you start out with $2 per bird and make any money? Loved your test! Keep up the great work. Thank you for the info! Been looking at true costs to raise birds for our meat delivery business. Wasn’t sure the feed conversion rates for Cornish cross, so appreciate the great info on your experiment! I did the same thing a few years ago and definitely will not raise anything but Cornish for meat birds. Good article. Thanks.